There’s a lot of hype surrounding Scott Moir and Tessa Virtue these days. These years, really. And it’s understandable. As the most decorated figure skaters in Canadian history, they’ve shattered records, raised the bar sky-high, and utterly entranced us in the process with their transcendent performances. Scott and Tessa’s spectacular combination of world-class athleticism and out-of-this-world artistry casts a spell on everyone who lays eyes on them. Recently, their magic has stirred up an even more voracious feeding frenzy than usual, drumming up an insatiable appetite for more of Tessa & Scott, the brand. In the months surrounding the 2014 Olympic Winter Games, they graced the covers of countless magazines. W Network even released a reality show about them earlier this year. But at the centre of all the hubbub are two very grounded individuals who see through the fuss and refuse to let go of what they know really matters: being good people and always doing their best. I had the great privilege of talking with Scott and Tessa when they were in Ottawa, Ontario last weekend for the Investors Group Stars on Ice presented by Lindt tour. Both during the interview and when they were “off duty,” they were friendly, gracious and humble; in other words, everything they appear to be. They were also generous with the little time they had to spare between warm-up and physiotherapy appointments, happily stepping off the ice to share some insights into what it’s like to be Scott and Tessa, the people, at such an interesting point in their lives. Scott and Tessa are at a crossroads. 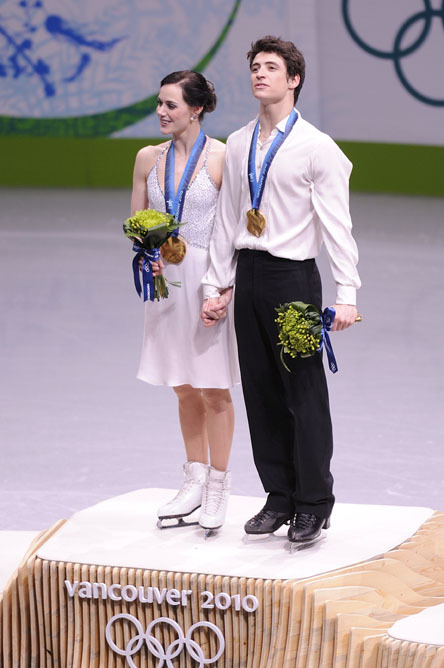 They’ve spent nearly two decades in a close collaboration that has earned them an outstanding figure skating résumé, including two World Championships (2010, 2012), six Canadian National Championships (2008-2010, 2012-2014), and Olympic gold (2010) and silver (2014 in both the ice dance and team events). Skating partners since Tessa was eight and Scott was 10, they share a special story that took them from their hometown of London, Ontario; to Canton, Michigan, where they moved as young teenagers to train; and, ultimately, all over the world, where they met with everything from joyous triumphs (at Skate Canada International in 2009, they became the first ice dancers to receive a perfect 10.0 score in international competition), to heartbreaking injuries (Tessa’s compartment syndrome was particularly difficult), to coming of age in the global spotlight. I won’t go in-depth on their backstory; if you’re interested, there are plenty of ways to learn more, including reading their 2010 memoir from House of Anansi, Tessa & Scott: Our Journey from Childhood Dream to Gold. Suffice it to say that this focused, disciplined duo has already accomplished a lot. Yet they’re still very young, with long lives stretching ahead of them. Right about now, they’re considering which direction they want to take. Scott and Tessa still haven’t decided whether to retire from competitive skating. (In his words, “We’ll announce as soon as we know.”) But they’re staying open to the many possibilities that lie before them, as two young people who are clearly bright, thoughtful, talented and hard working. Those possibilities include welcoming a little breathing room into their lives. So far, the reality of their decision to take a break hasn’t really hit them. Since the 2014 Olympic Winter Games in Sochi, Russia, they’ve kept up their training schedule in preparation for Stars on Ice, which runs until May 15. But after the tour, they know they’re in for a bit of a culture shock. Whether or not they lace up for another Olympics, the decision won’t be about unmet skating goals. They’ve given their all every time they graced the ice, pushing the boundaries of their sport each step of the way. After their flawless gold medal-winning free dance in Vancouver, they did the seemingly impossible, raising the stakes and delivering a stunning execution of what Tessa calls an “extremely ambitious and demanding program” in Sochi. So if the next four years don’t see Scott and Tessa reuniting with Team Canada, what might they do instead? Tessa is in her third year of a psychology degree at the University of Windsor, which she plans to focus on more heavily in the coming months. Scott has been on a break from school since moving to Michigan, and plans to get back into it, though in what subject, he’s undecided. He’s also thinking of pursuing some non-academic, more hands-on endeavours, like woodworking or contracting with his older brother. “(My career) was always about skating and it’ll be fun to learn different trades,” he says. Neither one seems daunted by branching out into the world beyond skating. Tessa attributes that adaptability to their supportive families. “We’ve grown up with parents who never really wanted us to identify ourselves as skaters,” she says. “So we’re Tessa and Scott the people, the students, so many other things, and skating is what we do, it’s not who we are. So I think that will really help with the transition or this next adjustment of not training every single day. As close as the two have grown, and as accustomed as the public is to seeing Scott and Tessa as a pair, the truth is that they also have their own separate lives. The public and the media have insisted on imposing their own narrative on the duo’s relationship, but it doesn’t reflect the real story. Tessa agrees that the speculation seems to come from a sense of investment in their evolution as skaters. “I think people feel like they’ve been part of our journey, which is really special and we’re really grateful for that support,” she says. Still, given Scott and Tessa’s reluctance to lay everything bare on Twitter, it’s surprising that they signed up for W’s reality show, which was shot over several months in late 2013 and early 2014. “The reality show was an interesting choice because… I’m not a fan of reality television,” says Scott. “We wanted to do something that was more of a documentary series, so it was interesting the way it came out.” That way, from what I gleaned from the episode summaries, points to underlying tensions between Tessa and Scott, trying once again to suggest there’s more to their partnership than meets the eye. For Scott and Tessa, the reality is that what they went through, as people and as athletes, goes a lot deeper than what the rumour mill sometimes tends to churn out. Since they were first paired in 1997 by Scott’s aunt, figure skating coach Carol Moir, their partnership has pushed each one to be a better person: stronger, more confident and more giving. Their early pairing led to a unique unison that earned them accolades and plenty of medals over the years. But it also laid the groundwork for the supportive friendship that has kept them soaring, no matter how challenging the circumstances. “We’ve changed so much in 17 years,” says Scott. “When we moved away from home at 13 and 15, we were each other’s families, really, and we needed to be there for each other. But then there came the teenage years and growing into our own, when we kind of moved apart and then came back together. “Then after 2010, we were thrown into this business world that we didn’t know existed in skating. We were in shows and getting sponsorships and we were just kids. So we’ve had this learning curve together and those are experiences that have changed us as people, and I think it’s a unique part of our story, having a relationship that’s so strong. 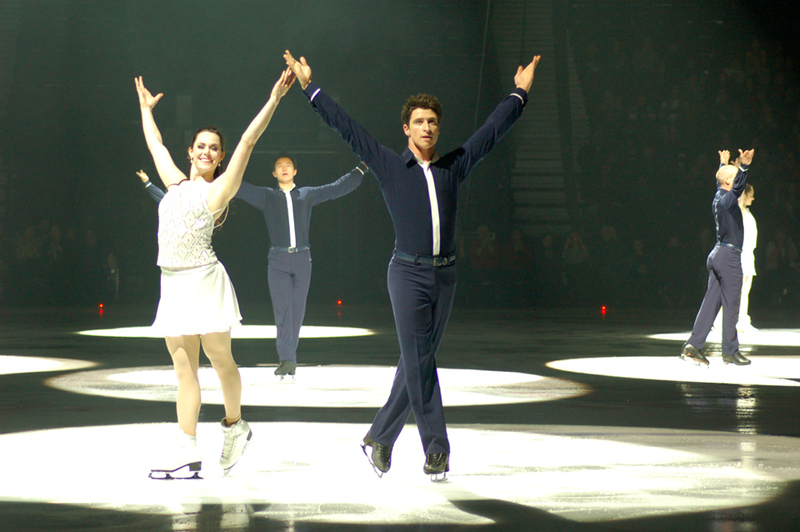 Looking back, Scott and Tessa have no regrets. They even view Tessa’s compartment syndrome, which Scott says was far more grueling than most people realize, as an integral part of their story, one that played a role in getting them where they are today. Looking forward, both Tessa and Scott are very clear on what they want to accomplish. They may not know what form it will take—competitive figure skating, coaching, choreography, costume design, volunteering, sports psychology, carpentry, or something else altogether. But whatever they do, they plan to do it with integrity, living lives that reflect their very best and that continue to make those around them proud. For the latest on Scott and Tessa, visit virtuemoir.com, and follow @ScottMoir and @tessavirtue on Twitter, and @scottmoir14 and @tessavirtue17 on Instagram. Thank you to Barb MacDonald, Skate Canada and Stars on Ice for making this interview possible. What a charming and fresh insight into these special Canadians; thank you Amanda! Tessa and Scott embody such sterling qualities, as individuals and as a partnership. That and their transcendent talent make them truly inspiring! Glad you enjoyed it, Catherine! Tessa and Scott are extraordinary on a lot of levels; I’m thrilled to have them as Kickass Canadians.